The Reds lead the standings by six points following the latest round of fixtures on Boxing Day – and are seven ahead of reigning champions Manchester City. 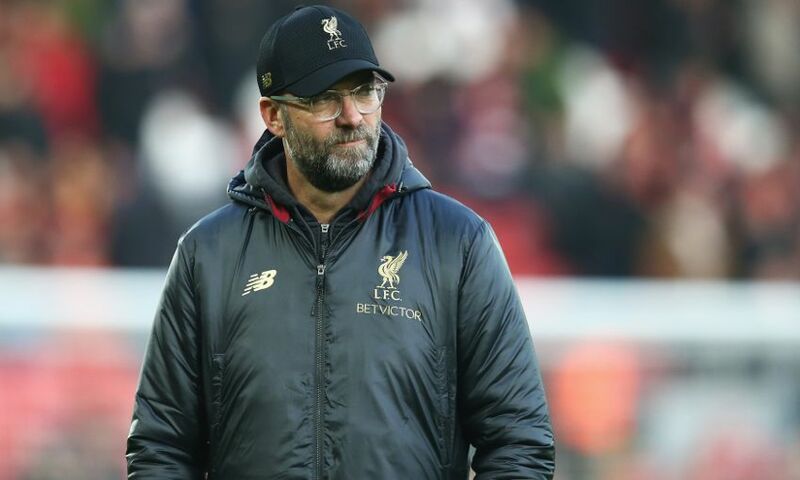 However, as he prepares his side to face a resurgent Arsenal at Anfield on Saturday, Klopp has explained why such details are not being taken into consideration at this stage. The manager addressed the media at a press conference at Melwood on Friday morning – read on for his thoughts on the task of facing Arsenal, stopping his former striker Pierre-Emerick Aubameyang and what it means to see his team at the division’s summit. To do much better than we did at Arsenal would be a good idea because we were, especially defending-wise, not as good as we can be or as good as we were after that. I think it was the period of the Napoli game as well when we didn’t do too well in Naples, so we needed these couple of weeks for adjusting a few things. We did that. They are strong, they are good with the ball, they are very lively, the counter-attacks are crazy quick. With Aubameyang and Lacazette [it is] an outstanding striking couple up front. Being creative in behind, being quick on the wings, having power with Iwobi and all that stuff, it’s just a really good team. That’s what we prepare for. Because it was not that long ago [we played them last], it was November, we used the game we played for analysis and it gave us a lot of information, important information. Still, it will be difficult. Not a lot, to be honest. We didn’t think about the distance to other teams before it because it is just too early to think about it. If we are six points ahead with one game to go it is a big moment! In the moment, nothing happens. To explain our situation, I am not sure if we spoke about targets before the season [started] but it is clear with a team like Liverpool, the size of the club and the quality of the team you should go for Champions League qualification. That was our target, 100 per cent. We did it twice in a row and we wanted to do it a third time in a row. We wanted to improve as a team, play better football, be more consistent, be more stable – all that stuff. We are still on that way, nothing else. It means the only thing that is different to last year is that our situation is better in comparison to last year, but we are not even qualified for the Champions League yet. That means we need to play football, like we like to do, and try to get results, what we want to do. Then we will see what happens, nothing changed. My 100 per cent feeling was exactly like that after the [Newcastle] game, it was exactly like this – there was not a little bit of celebration. It is just not time for that, it is just a result that another team had. We play now Arsenal, City, Wolves in the FA Cup, then Brighton and so on. There are so many games to go and it is just not time to think about it, it’s just time to think about the next opponent. They really ask for all of our concentration and that’s why we do it, it is not possible to do it differently. 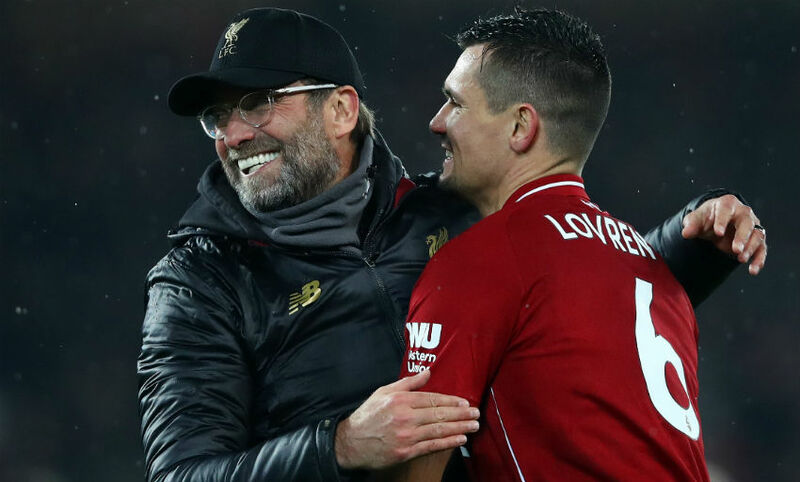 I thought 2018 was probably so far one of the best years Dejan ever had, not only what he achieved with his teams - with us in the Champions League final and with Croatia in the World Cup final - performance-wise as well. Very stable. These kind of old, old stories when people said this and that can happen from time to time, I can’t remember the last time, to be honest. Maybe it was Tottenham in October 2017? I was never in doubt about it and he has had a brilliant year. After the World Cup, he came back injured and that’s not cool. That’s why we could not even think about him because he was not able to train and to play. Since then, he is in. For us [with] our two last-man standing [Lovren and Van Dijk] if you like, it’s really important it works out. But it is not a surprise. We qualified for the Champions League last year with this couple and it was a good year so far, so I am not surprised how good [he has been]. A lot, a lot. He is an outstanding player, an outstanding person, a really funny guy, a nice guy as well. He has the mindset for a proper goalscorer, so he is always relaxed in front of the goal – maybe not always, but often enough. The combination of speed and these finishing skills is pretty rare, so that makes him this exceptional player. Of course, he is a threat in the big space and in the small space – and he is good in heading as well. It is a nice package that Arsenal bought there, so that’s tough. In combination with Lacazette, it’s difficult to deal with because they combine pretty much everything if you play with two strikers that you wish for. It is just a very, very, very good combination. We said it already in half-time; I think we solved the problem already at half-time. They are not big mistakes. It is not easy, I can only speak for me if you prepare in one week for three games, you do everything and then afterwards you have to make sure they [the opposition] don’t mix it up, especially if they play similar systems. It is good that I have my partners, my coaches, and we can talk about it again and I don’t mix it up! This game was really different. Where the two [Newcastle] strikers where after we overplayed, waiting for the balls, is why we missed two midfield players for the second balls. That’s why they had the counter-attacks, that’s what we had to adjust. The next game will be completely different, yes. It is another formation, which is another challenge - Unai Emery likes to change systems a lot, even in the game sometimes two or three times. That will be pretty interesting as well, but we have to learn from the game always – that’s always how it is and that’s why half-time is so important. You can prepare as good as you want, but the moment when the game starts and see [something] is a bit different because they have their own ideas as well, then you see at half-time and you try to adapt to that. With the Arsenal game, it is clear [it will be tough]. They had 62 per cent possession against us in the first game and that was mainly because we didn’t defend well up front, because they could pass through and it was quite difficult to get the ball back. When we had it, we were not really calm enough in our own possession because they press, they press high as well, so you need to find solutions for that as well. In the end, we had big chances, I think we had the bigger chances – or maybe it’s me and I only remember our big chances! It was just a very difficult game and that’s important information for us. They are good; Unai Emery doesn’t look at the points we have and they have before the game, he only wants to win a football game – and that’s exactly what we want to do. If you would say now we have 13 points [more] and we took any information out of it then we would be really silly. The good news is the boys are not silly. That’s what they show now all the time. To win against Arsenal is always difficult – it will not be easy in the future and will not be easy tomorrow, but it is what we want to do. For that, we need to play really our best football and we need again a proper atmosphere. If I could ask for something, I would like to have the atmosphere around when the people knew about the result for Man City [at Leicester], maybe we can do it always like that. [They heard it was] 2-1 Leicester and then really go for it; that was exceptional in that moment, so if we could be that much on our toes that would help a lot.